There are many occasions for when you might want to use a piping bag, whether they be sweet or savory. Yes, you read that correctly: sweet or savory. The most common sweet treats that come to mind are usually cakes and cupcakes. However, a piping bag can come in handy for piping the decorations on a gingerbread house or for piping mashed potatoes back into the skins in your twice-baked potato recipe. Any way you slice it, the steps to preparing your pastry bag remain the same. We recommend using 12-inch pastry bags, especially for a gingerbread house, where a larger bag would get in the way. Any kind of pastry tips will work, but for straight lines, a #10 plain round tip is good for bolder lines and a #2 plain round tip is best for finer lines. 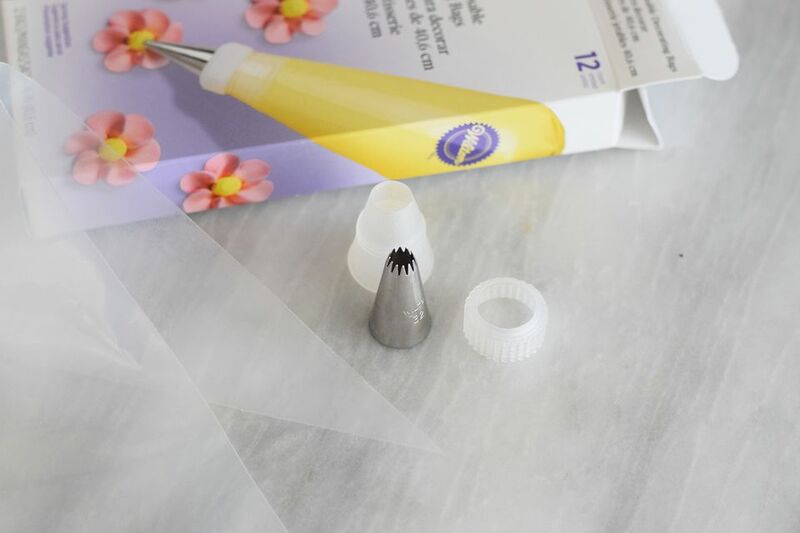 It's a good idea to use a pastry coupler if you intend to change pastry tips, like from a star-shaped tip to a writing tip, and so on, for your project. Otherwise, if you just slip the metal pastry tip into the bag without a coupler, you'd have to completely empty the bag to change tips. Or you would have to start another pastry bag and have three or four with different tips going at the same time. It's doable, but not time, nor cost effective with the number of supplies you'd go through. Once all of your supplies at the ready, insert the coupler into the pastry bag. In order to gauge how much of the plastic bag tip to snip off, insert the coupler into the empty pastry bag and snip off the top. You want to make sure that you are snipping off enough that the round, bottom-portion of the coupler can peak out, but not enough that the whole coupler falls out. Kitchen Notes: It's okay to have plastic covering the grooved edges of the coupler since the ring with the tip will be screwed on over it. Once the top of the pastry bag has been cut off, push the coupler through so a few of the screw threads are visible and the fit is tight. Attach the pastry tip you have chosen to the coupler ring, then place the plastic coupler ring over the tip and tighten. Make sure all the plastic pastry bag edges are under the coupler ring so there are no leaks. Nothing is as frustrating as baking a beautiful, frosted cake and then having a rogue pastry bag messing with the icing when you're piping decorations. Kink the pastry bag by twisting it behind the coupler and stuffing it into the tube so the filling won't pour out when filing it. To keep both hands free, place the pastry bag over a wide-mouth quart jar or tall glass and cuff the excess bag over the edges. This will not only help you with filling the pastry bag, but it will also help keep things tidy. Now that one hand is free, you can hold the jar or glass with one hand. Using a spatula, fill the pastry bag 1/2 to 2/3 full, otherwise, you risk the icing popping out the backside of the pastry bag when you are pipping. Squeeze the filled pastry bag to get out any air bubbles. Then twist the end and cradle the pastry bag against your palm, between the thumb and rest of the fingers, wrapping the fingers around it and squeezing with the fingers to control the flow of icing.